Megger Group is a world leader in designing and commercialising electrical test equipment and our products have helped our customers keep their power and communications systems reliable and safe for over 100 years. Megger’s ethos is to work closely with its customers and industry specialists to deliver the most appropriate products and offer a professional after-sales service. As such, we are continually investing in innovative manufacturing techniques, research and development and design engineering. 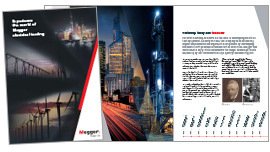 Megger is an exciting, engaging company to work for, offering a wealth of knowledge and opportunities to its employees. The work is challenging and varied. Each department is made up of friendly, enthusiastic and dedicated teams striving for the very best results. Working for Megger means working for a business with a great reputation, a prestigious history and a strong, innovative future.